Lyndon (population 566) is located on the banks of the Rock River, along Il Route 78 and the former Il. Route 2. This places it in the south central area of Whiteside County about 15 miles southwest of Rock Falls. The Chicago, Burlington and Quincy Railroad ran through north of the community. The town's school system goes back to 1854. Lyndon has a rich history of supporting its school system and did so very well. A two-story building was built in 1873. Another school was built sometime around the turn of the century and housed the high school until 1960, when the building above was built. This building is pictured to the right as well. Sometime in the late 1960s a consolidation effort was initiated with nearby Prophetstown High School. This effort became a reality in 1969. The gymnasium is still in use, as the home court for the Sterling Christian (located in Galt) Basketball teams. 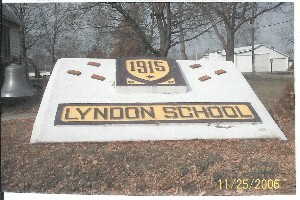 "The Lyndon High School shown on your site was built or opened in 1915. It closed when the new Lyndon High School opened sometime in the 1960's. When Lyndon and Prophetstown consolidated, the Lyndon High School closed after the 1968-69 school year. The Lyndon High School then became the Lyndon Junior High School housing the 7th and 8th grade classes. 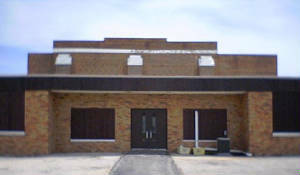 The original Lyndon High School housed just the 6th grade classes. Prophetstown-Lyndon and Tampico consolidated beginning with the 1996-97 school year. The schools in Lyndon then closed up completely." School Fight Song: "We're Loyal to You Lyndon High"
Victory from you Lyndon High! The Lyndon High School kids competed in the always tough Two Rivers Conference. Member schools included Annawan, Atkinson, Mineral, Tampico, Prophetstown, Erie, Hillsdale, Cordova, and Port Byron. Sports offered included football (6 - man), basketball, baseball, and track. Lyndon HS brought home IHSA hardware in basketball winning two District titles. Some scores from the annual IHSA State Tourney were located on a website titled "Illinois Postseason Basketball Scores." The scores located are listed below. Season records and coaches' names of these and other Lyndon High School teams are needed. Franklin Grove lost in 2nd round. After the 1968-69 school year Lyndon High School closed and consolidated into the Prophetstown school district. John Morse - Led Lyndon on the court during the early 1950s, and was named to the Two Rivers All-Conference team in 1952-53. "I went to 3rd and 4th grade at the Lyndon Grade School. The photo with the school and small building attached was my 4th grade classroom. My family moved back to Sterling during my summer vacation in the mid-sixties. I really enjoyed going to Lyndon. Neil Johnson was a good classmate of mine at Lyndon and later won the 1975 state class a 100 yard dash and 2nd in the 220 dash while competing for Prophetstown High School." 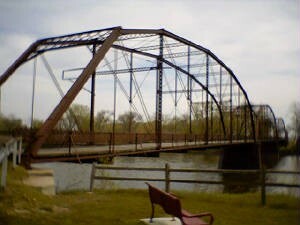 Then Vice-President Teddy Roosevelt made a stop in Lyndon and crossed this bridge. It still stands.